New York had five charters during its colonial era. Since independence, it has had 9 proposing state constitutional conventions and 2 state constitutional conventions to ratify Federal law (for the original U.S. Constitution in 1788 and the 21st Amendment repealing prohibition in 1933). Since 1821, it has had 12 popular calls to convene a state constitutional convention, including the upcoming 2017 referendum. Since 1846, it has had at least one call or convention every 20 years. 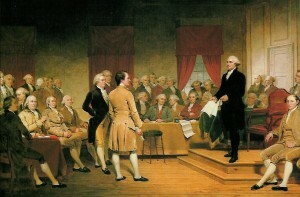 Since 1801, New York’s legislature has not restricted a convention’s agenda by statute, and since 1846 has been constitutionally prohibited from doing so for conventions called via the periodic referendum. Compiled From Various Sources: New York Department of State. Votes Cast For and Against Proposed Constitutional Conventions and Also Proposed Constitutional Amendments; Lincoln, Charles Z. 1906. The Constitutional History of New York from the Beginning of the Colonial Period to the Year 1905, Showing the Origin, Development, and Judicial Construction of the Constitution. 5 vols. Rochester, NY: Lawyers Cooperative; various publications by Albert Sturm, including Sturm, Albert. 1982. “The Development of American State Constitutions.” Publius 12 (1): 57–98; Galie, Peter J. 1996. Ordered Liberty: A Constitutional History of New York. New York: Fordham University Press.